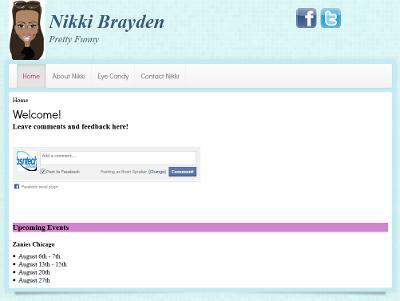 Nikki Brayden contacted us about two weeks ago to make her a website. She is a comedian up in the Chicago area. She put a request in on our website asking to have a site designed and then called and left us a voicemail. We promptly returned her phone call, understood what her needs were, and then she placed her order the same day. Nikki made it clear that she wanted to have some kind of website up and running by August 5th – which was just a few short days after her order was placed. We put together a design for her website and put the information on the site that was imperative to have on there. Once that was finished, we then added a couple of add-on features to the site. Nikki now has full access to her site to make changes and update it as she needs to!